234 pages | 29 B/W Illus. Innovation is the translation of a new method, idea, or product into reality and profit. It is a process of connected steps that accumulates into your brand or reputation. However, there can be many pitfalls and wrong turns on the road to realizing this goal. 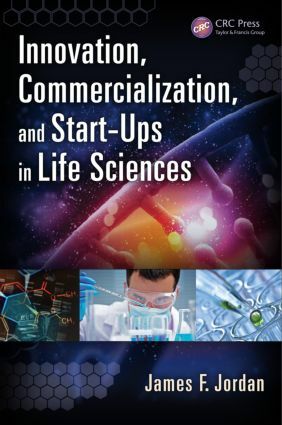 Innovation, Commercialization, and Start-Ups in Life Sciences details the methodologies necessary to create a successful life sciences start-up from initiation to exit. You will gain an appreciation for the necessary data, partnership, and skills to be acquired and the constituencies that must be satisfied along the way. The book examines how life sciences start-ups can create an exit for their investors by recognizing that a liquidity event is not consummated without due diligence. Due diligence is bigger than validating accounting transactions. It ensures the company is solving an important customer problem, demonstrating sales access, and making sure that intellectual property is impervious to competitive advancement. The due diligence process supports the telling of a compelling story to customers, investors, regulators, and acquirers. Written by an expert who has worked with more than 200 life sciences start-ups during the past decade, the book discusses specific processes and investor milestones that must be navigated to align customer, funder, and acquirer needs. It examines these processes from the perspective of marketing value through a focus on the needs of individual constituents—investors, regulators, customers, and exit candidates. The book presents data and analytical processes articulating the fundable milestones for angel and venture capital. It gives you the tools needed to create branding for public investors and more. "So how do you get more new innovative technology to market? Well, you take risks for sure, but you have to have a process for churning the evolution of technology and turning concepts in the minds of researchers and entrepreneurs into commercialized products in the market. The contents of this book will not only do that for the reader, but the book will also show the pitfalls to avoid along the way. Not every good idea is able to get to market. … And what causes innovators to fail? The answers to these and other important questions are addressed in the book." "This book, and the approach the author describes in it, is based in extensive real-life experience. The author gives the reader the theory behind innovation and commercialization, but then adds the application details only an experienced professional can deliver. … I like the fact that the book is driven from the perspective of the investor versus the technologist or policy analyst. … I think the author has written a very useful guide that is clear and compelling." Can the Technology Create a Franchise Category? Can the Technology Create a Product Category? Is There a Specific Class of Patient or Clinical Situation Where the Patent Would Be the Obvious Answer? How Can the Patent Be Built upon over Time to Evolve for Distance as Other Players Attempt to Enter the Market?